There are various types of greatness in wines. Some wines present a perfect example of a particular grape, in all its greatness. Pinot Noir is one of the best in doing so. Other wines present the greatness of the soil in which the grapes were grown. Pinot Noir also reflects the soil more than any other grape. Then there are the few wines that express both the greatness of the grape and the greatness of the soil. This wine is one of them. One taste, and the response won't be a smile or a "wow." It will be chills and goosebumps. Guaranteed. 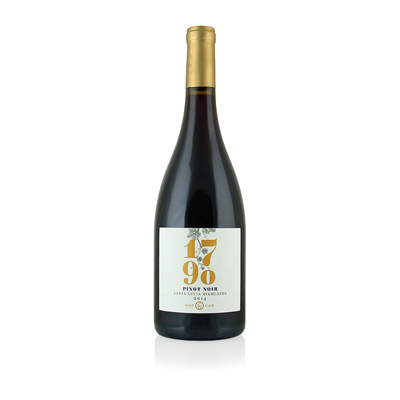 It's called 1790 because that is the date that grapes were first planted in this region by Spanish settlers. They had no idea that this was to become one of the finest Pinot Noir areas in the U.S. Most of the wines from this region normally sell for $50 to $100 a bottle. And quickly. It's not just uncommon to find a wine of this quality at this price. It's unheard of. When we tasted it, we basically looked at the label to see if maybe they misspelled something, that maybe it wasn't Santa Lucia Highlands. But there it was, in all of its glory and wonderment. The grapes were hand harvested at night and brought to the winery in small boxes so as not to bruise them. After fermentation, they were aged in 100% oak barrels from France, the finest and most expensive barrels you can buy. The results are everything you'd expect. Sensuous scents of cherry, cotton candy, mint, spice and cranberry are just the beginning. They deliver all of these on the palate and leave you breathless.